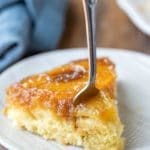 Lemon pudding cake is a layer of lemon pudding that bakes underneath a layer of cake! For me, one of the most difficult parts of trying to lose weight is keeping my sweet tooth in check. As much as I love the idea of a healthy dessert, a lot of times they just aren’t very satisfying or they have tons and tons of sugar to make up for the missing fat. So, I’ve had to figure out Weight Watchers dessert recipes that will work for me. Along with trying to lose weight, I’ve been trying to get healthy. So, I’m trying to cut down on my sugar intake while also finding ways to replace the fat and calories with flavor. 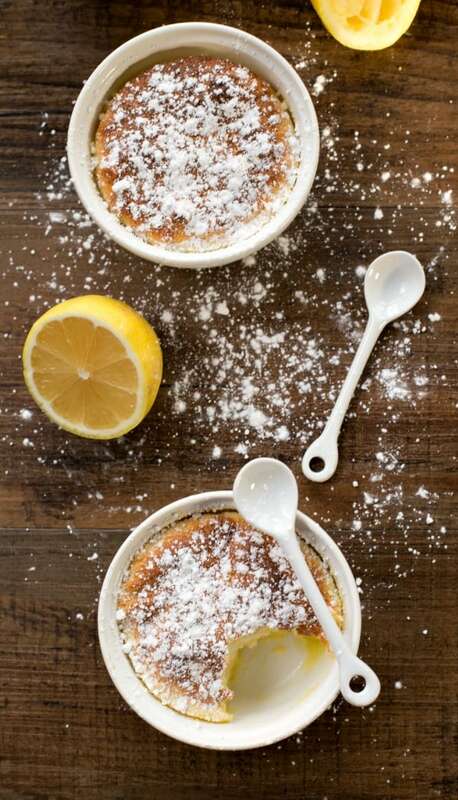 So, when I saw these Lemon Pudding Cakes, I knew this recipe would be a winner. They’re still sweet, but they have a bright, tart lemon flavor that really shines through. It’s also fun to see how the batter bakes into a smooth pudding underneath and a light, airy cake on top. I use cake a little loosely when it comes to these because they’re a cross between a light meringue and a traditional cake. One of my goals has been to work on eating smaller portions. I’ve been working on make more Weight Watchers dessert recipes. Aside from how delicious these cakes are, they’re also pre-portioned, which is huge for me. I have a hard time not going back for that second slice of cake, but it seems more satisfying to be able to eat the whole cake (even if it’s a little one). Having these already portioned was also nice because I knew how much I could eat, and so it takes the guesswork out of things for me. Plus, did I mention how good they taste? Because, really, if you like lemon, you should absolutely make these! 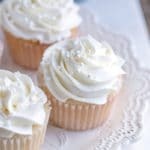 More Weight Watchers dessert recipes! 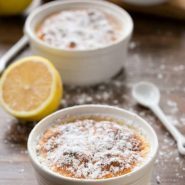 If you’ve tried this lemon pudding cake recipe, don’t forget to rate the recipe and leave me a comment below. I love to hear from people who’ve made my recipes! You can SUBSCRIBE to receive my latest recipe newsletters or FOLLOW ME on FACEBOOK, INSTAGRAM and PINTEREST for even more delicious food. 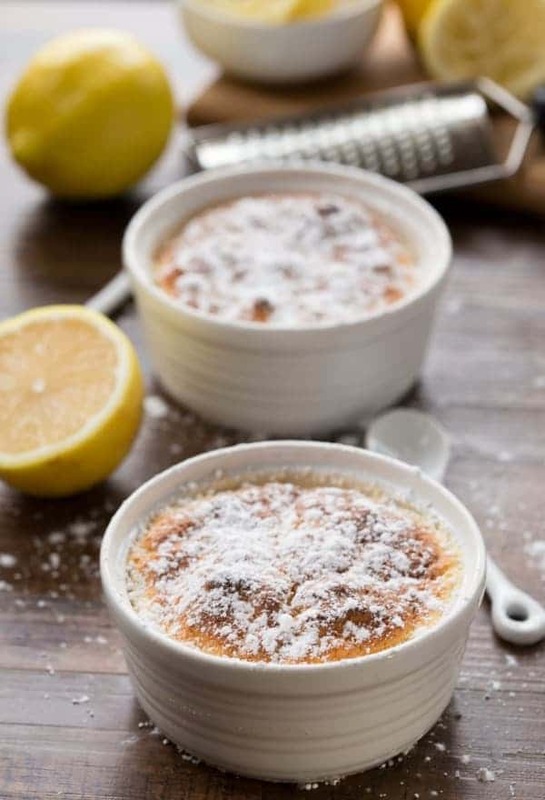 Lemon cake and pudding that bake in one ramekin. Preheat the oven to 350 F. Grease six 6-ounce ramekins with vegetable oil spray. In a medium bowl, whisk sugar and flour together; set aside. In a separate large bowl, whisk together egg yolks and butter until well blended. Whisk in the milk, lemon juice, and lemon zest. Pour the lemon mixture into the sugar mixture, and whisk until well combined. In a medium bowl, beat the egg whites until firm peaks form. Gently fold the egg whites into the lemon mixture. Divide the batter between the prepared ramekins, and transfer them to a small roasting pan. Place the pan in the oven, and pour in enough hot water to reach halfway up the sides of the ramekins. 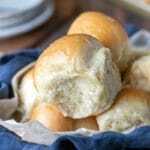 Bake for 35 minutes, or until they are puffed and golden on top. Transfer the ramekins to a rack to cool for 20 minutes. Dust the tops with powdered sugar, if using, and enjoy! The cakes were quite good. They were very light and refreshing. Thank you for sharing. Do you have the nutrional value or the original WW Points # ? And can I make them the night before? Sure hope you are responding after so many years!! I have a question about the meaning of T ? How much butter and lemon please ? Sorry i am french ! this recipe seems to be delicious! Thank you for the answer. T is for tablespoon, and tsp is for teaspoon. If you have any other questions, let me know! sounds great…I am on WW too! Do you have the point value for this? Thanks! The cakes are 7 points each. Hope that helps! Looks great! But isn’t this just a soufflé? Thank you! There are some similarities, and I guess this could be considered a souffle variation. The top (cake) portion has a souffle-like texture, but it lacks the dramatic rise/fall of a traditional souffle. I love lemon puddings! I can imagine how delicious this must have been.. definitely need to make the recipe soon. Thanks!! Hope you enjoy them! Looks yummy! I was wondering if you could give us the WW point value for this dessert? Thanks! Thanks! Without the powdered sugar on top, the cakes are 7 points each. Hope that helps! 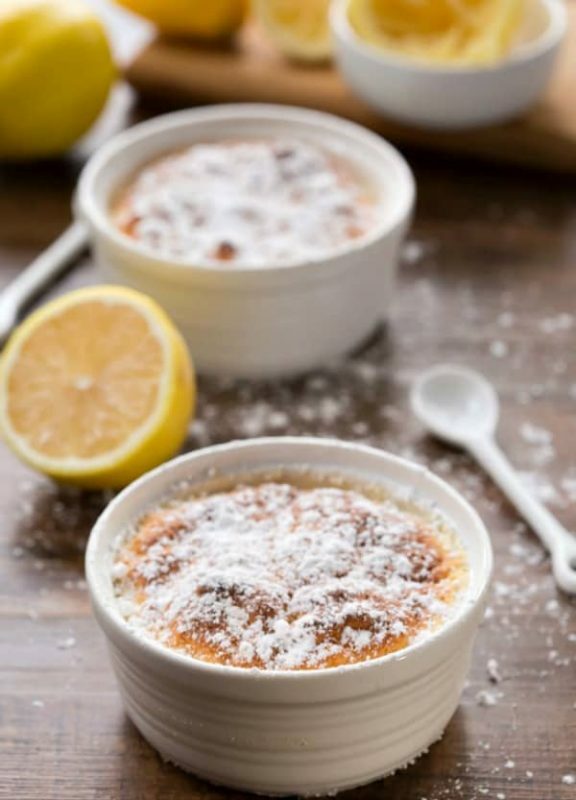 These lemon pudding cakes look terrific, Kate! What a great way to satisfy sweet cravings. Pinning! I know what you mean! Figuring out healthier desserts has been the hardest part of trying to eat healthier. I’ve been working on some, and I hope I’ll have more healthier dessert recipes coming up soon! This looks super yummy! I love individual desserts!